Uh oh! 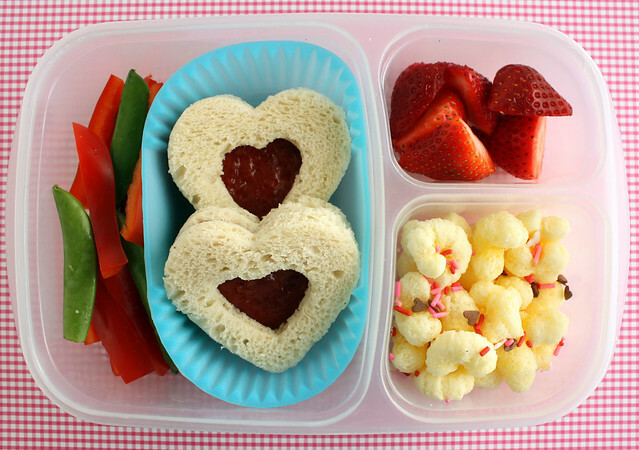 I started busting out the Valentine bentos this week. Look out! Wyatt chose to have school lunch. I love it when he does that on Mondays because then I don’t have to pack any lunches and I can sit down for breakfast with the kids. I had orange slices and oatmeal with brown sugar and milk, if you were wondering…. 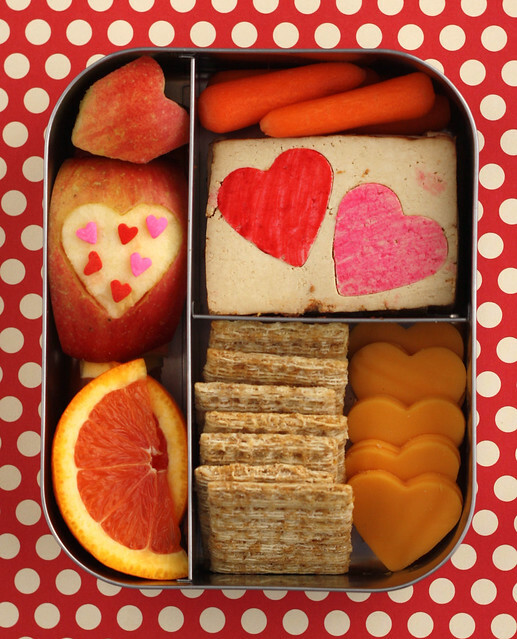 On Tuesday, I packed my first Valentine’s lunch of the year! It’s a little early, granted, but I dug all my Valentine supplies out of the cupboard over the weekend and I was excited to use them. When I told my husband on the phone that I’d made this lunch for Augie, a hint of panic crept into his voice as he said, “But…er…um…wait! I thought Valentine’s day was a long time from now?” Poor guy thought he’d missed it and that he was going to be in trouble. Hee hee! 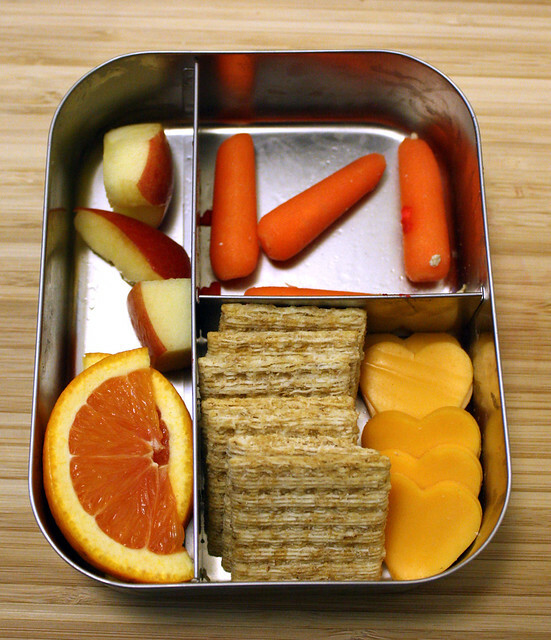 This is what I packed for Augie: apple chunks with a heart cut-out (tutorial here) and a few heart sprinkles on top, cara cara orange slices, carrots, teriyaki baked tofu cut with the same heart cutter and decorated with food markers , Triscuits, and soy cheese hearts. This was packed in our Lunchbots Trio which is on sale, along with a few other boxes through 2/5. 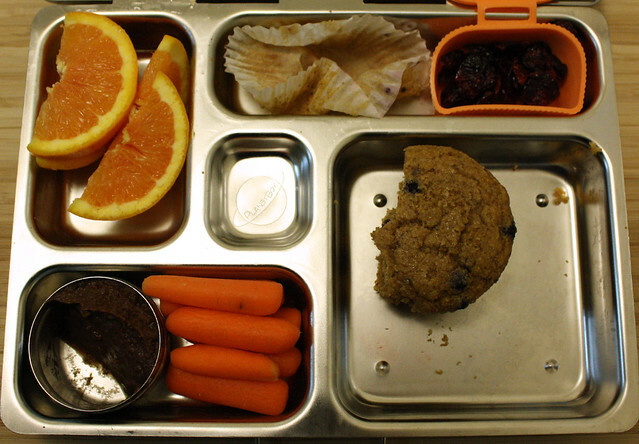 Wyatt’s lunch had a bit of a breakfast-for-lunch theme going on: orange slices, leftover chicken breakfast sausages, dried cranberries, a whole wheat blueberry muffin, strawberries and carrots and bean dip. The carrots and bean dip aren’t really breakfast-y, but whatever. This was all packed up in our PlanetBox . It turns out that neither kid was excited about his lunch on this particular day (even though I rather liked them). Augie left more than half of his lunch, which is quite unusual. And it looked like Wyatt only ate his sausages, the berries and a bite or two of the muffin. 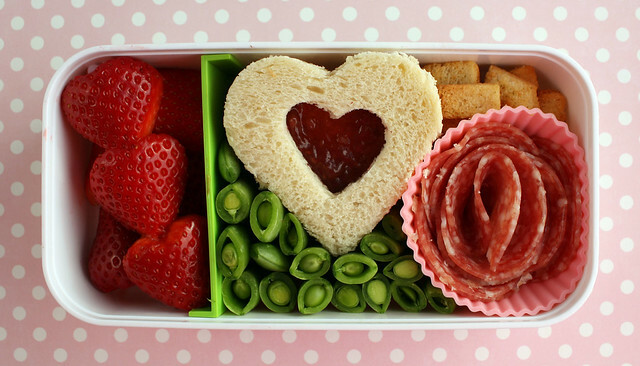 On Wednesday, I gave Augie strawberry hearts on a heart pick from the dollar store (it’s pretty hard to see), a strawberry jam sandwich, sugar snap peas, a few croutons and salami in a pink silicone muffin cup . This was packed in a single layer of our monbento box . 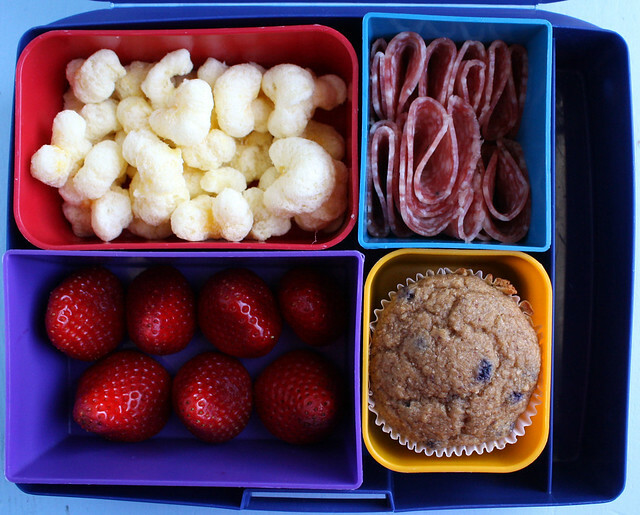 Wyatt’s Laptop Lunch was packed with a bunch of his favorite foods: Pirate’s Booty, salami, a whole wheat blueberry muffin and strawberries. It came home completely empty too, which is quite rare these days. The boys had fraternal twin lunches on Thursday (because they weren’t quite identical). Augie’s lunch had snap peas, pepper strips, jam sandwiches, strawberries, and Pirate’s Booty with Valentine sprinkles. Wyatt had the same thing but his veggies were carrots and bean dip. These were both packed in EasyLunchboxes . 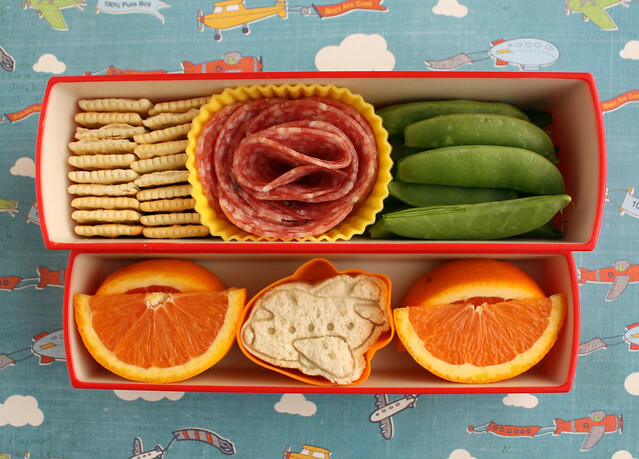 I took a break from hearts and all that kissy stuff on Friday and instead I packed Augie a simple airplane lunch. He had mini saltines, salami, snap peas, orange slices and a tiny sandwich that I stamped with an airplane cutter and filled with a dab of jam. I put the sandwich in a tiny little airplane cup to keep it from getting soggy from the oranges. 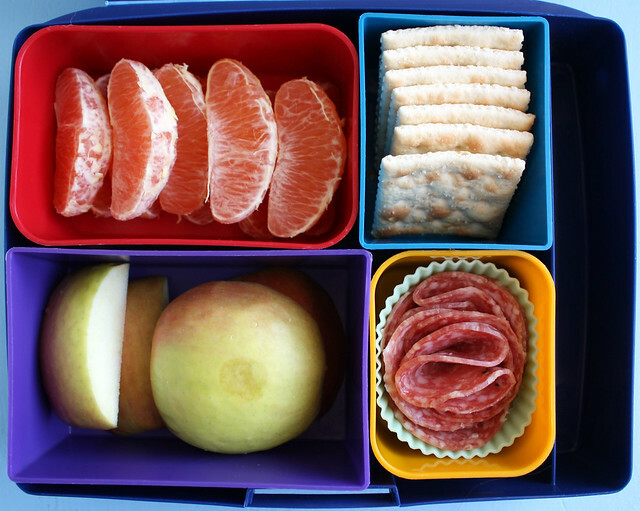 Wyatt’s lunch was dead simple: orange wedges, saltines, salami and apple chunks. 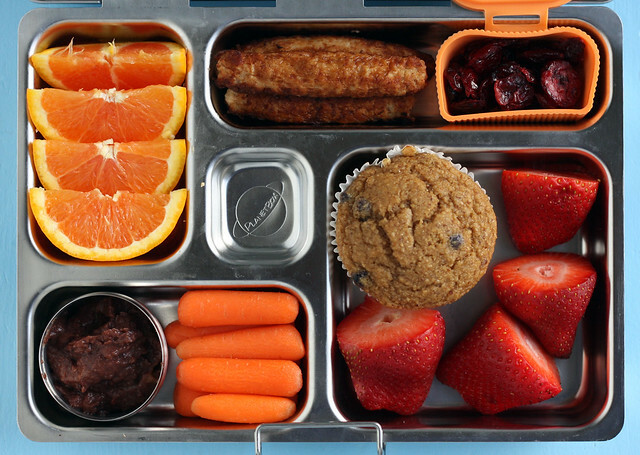 What are you eating for lunch this week? 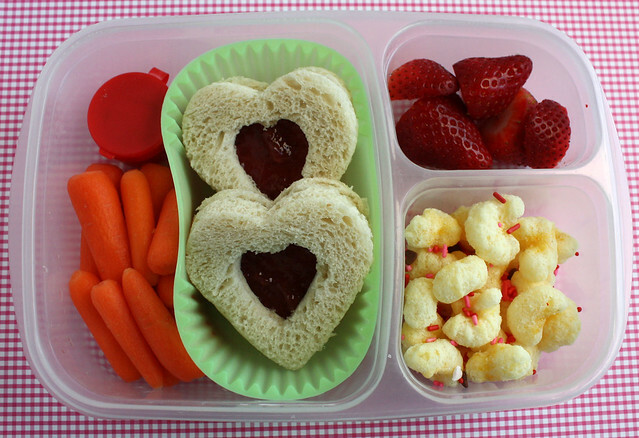 Any lovey-kissy lunches yet? Next post: Muffin Tin Monday: Baseball!